I can’t believe that I’d never had lasagna until I went off to college. But ‘exotic’ foods (Oriental, Italian, Mexican, Greek, etc.) were just not available in rural Montana where most of the residents were of German, Scandinavian or Irish heritage. Now, it’s one of my favorite casseroles. Sometimes I make it vegetarian; other times I add Italian sausage; both versions are presented here. And I recently added a grain-free version that uses thin slices of zucchini in place of the pasta. In a pinch, tube pasta such as penne or mostaccioli will also work. 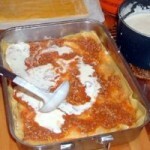 The casserole can be topped with a white Bechamel sauce (see below) instead of the mozzarella topping. I like to make just a bit of the sauce (about 1 cup) and drizzle it in a wavy pattern over the casserole before baking. Look for sheep’s milk ricotta (Roman Ricotta); it has a lot more flavor than the part-skim cows’ milk ricotta available in most groceries, or cottage cheese called for in some recipes. If you cannot find sheep’s milk ricotta, try replacing some of the ricotta with crumbled feta, then mix them together. 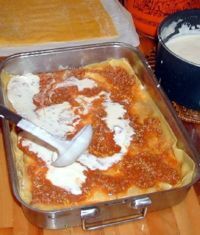 This recipe is adapted from a box of Golden Grain Lasagna pasta (2). This is the only brand made with durum wheat available in my local grocery, but I much prefer to use whole wheat or Ezekiel lasagna pasta for its whole grain content. See below, for variation with Italian sausage. I make my own tomato sauce, and add fennel seeds, which were not included in the original recipe. Sometimes I also add chopped fennel bulb with a few fennel greens to the tomato sauce when I add the carrots. If you’re under a time crunch, you can use Organic canned tomato sauce (I prefer Muir Glen brand), but first warm the ground fennel in a bit of oil to release their fragrance, then add the sauce to warm it and combine flavors. If you like your lasagna with a lot of tomato sauce, make 4 cups of sauce (2 recipes of my rich tomato sauce). Prepare tomato sauce. Before sautéing the onion, add freshly-ground fennel seeds to the oil, to release the fragrance. Then add onions and sauté, followed by the tomatoes and other veggies as per recipe. Keep warm. Cook pasta to just before the al-dente stage in boiling salted water (it will cook more in the oven); drain and set aside. In bowl, combine ricotta, spinach, eggs, minced garlic, salt and pepper to taste. Stir ground fennel into warm tomato sauce. Spread about 3/4 cup tomato sauce in bottom of baking dish. Layer with 1/3 of the lasagna pieces, half the ricotta mixture, 1/2 cup mozzarella/Romano, and another 3/4 cup of sauce; sprinkle half the minced garlic over all. Repeat layers once. Top with remaining lasagna, sauce and mozzarella/Romano. Or drizzle Béchamel* over the top, instead of topping with cheese. Bake, uncovered, in oven for 35 – 40 minutes. Remove from oven and allow to rest about 10 minutes before serving. You can use hot Italian sausage, but I prefer mild. Italian sausage is usually flavored with fennel, so you can eliminate the fennel seeds, unless you really want that flavor enhanced (like I do). You can add the cooked sausage to the tomato sauce, but I prefer to leave it separate, which allows more of its taste to come through. Before assembly, break sausage into small pieces and cook in heavy-bottomed skillet over medium heat. Drain off the fat. During assembly of the layers, sprinkle half the sausage pieces on top of the sauce of the first and second layers, with the garlic. [Or stir sausage into the tomato sauce]. If you’re avoiding gluten, wheat, or all grains, consider this excellent variation using zucchini strips instead of pasta. Of course, it’s great even if you’re not avoiding grains. Or try using pasta for one layer and zucchini for the other two. See Nourished Meadow (2) for a good pictorial recipe, but I prefer my own sauce recipe. You can make this with Italian sausage, as in the above variation, or without. Or make with Bolognaise sauce as below. You can also make with, or without the spinach. Wash zucchini, then slice thinly (1/8″), lengthwise. I found it helped to cut the zuc in half lengthwise before slicing with my mandoline. The thinner the slices, the more moisture you can remove from them using the raw method. Peel the top and bottom slices only. Arrange slices in a colander (or on paper towels) and sprinkle lightly with salt. Allow water to drain off, about 30 minutes. Rinse each slice under cold running water, then dry on paper towels, patting the tops dry. Do not cook slices before arranging in layers. OR: Bring a pot of water to a boil (I use my pasta-pot with basket); add zucchini slices and cook just until the zuc begins to get limp; remove promptly and rinse with cold water to stop the cooking (or immerse in an ice bath). Then dry on paper towels. Layer the zucchini slices in the casserole as you would the pasta. Bake as in original recipe (or in 350° – 375°F oven about 1 hour). This entry was posted in Baked, Dairy, Eggs, Fat or oil, Herbs, Leafy Veggie, Nuts and seeds, Onion family, Pasta, Pork, Spices, Uncategorized, Vine veggies and tagged cheese, cream butter, eggs, fennel seed, garlic, Italian sausage, milk, nutmeg, pasta, ricotta, spinach, tomato sauce, zucchini. Bookmark the permalink.